The 1231-11 is an IC package board tester that features high-precision, large-pin capabilities for high-density, fine-pitch boards. Index-type system simultaneously supplies, aligns, tests, and ejects boards, providing wait-free multitasking performance. High repeatability makes it possible to probe within an area with a diameter of 10 μm. The 1231-11 can perform 4-terminal testing of high-density wiring boards with up to 16,384 pins (200% more than previous models). Easy-to-understand icons facilitate intuitive operation. The 1231-11 also supports graphical display of electronic component connection information. 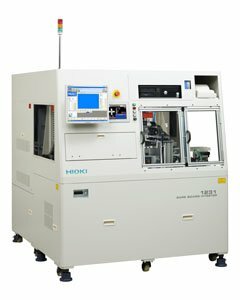 The 1231-11 supports combined testing with Zygo-manufactured systems.